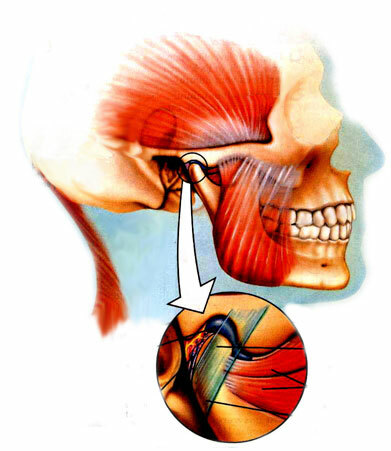 The temporomandibular joint (TMJ) is the joint connecting the lower jaw (mandible) to the skull (temporal bone). The lower jaw and the skull are connected by a number of muscles and ligaments, which function in harmony with each other if the lower jaw is in the correct position. The head of the jaw bone (lower jaw) is called the condyle and it fits into the concavity of the temporal bone called the glenoid fossa. The TM joint resembles a ball and socket with the round condyle being the ball and the glenoid fossa of the temporal bone being the socket. For normal joint function to occur, a piece of cartilage called an articular disc acts as a cushion or shock absorber between the two bones. When the lower jaw opens and closes, the disc stays between the condyle and the glenoid fossa of the temporal bone at all times. When this happens, this is a normal healthy TMJ and the patient can open wide without any discomfort and without any noise. With a normal opening, the patient should be able to get three fingers between the upper and lower front teeth when the mouth is open as wide as possible. In cases where the TM joint is functioning normally with the disc in the proper position, the muscles of the head, neck and shoulders function relatively pain-free. Temporomandibular disorder (TMD) is the condition referring to a joint that is not normal. The position of your teeth can affect the position of your jaw joints. Each jaw joint is a ball and socket joint. When functioning properly, the ball and socket do not actually touch because a thin disc of cartilage rides between them. 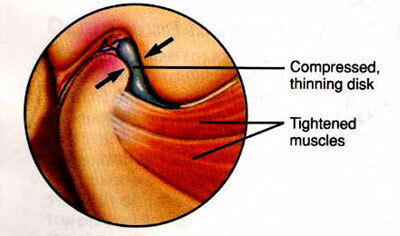 The disc acts as a cushion and allows the joint to move smoothly. Each disc is held in place and guided by muscles and ligaments. If your bite is not right, as in cases where the following may occur: deep overbite, lower jaw too far back, narrow upper jaw or upper front teeth crooked and tipped backwards, this can cause the jaw to become dislocated. Typically the disc is pulled forward. The lower jaw then has a tendency to go back too far and the top of the lower jaw, which resembles a ball (condyle), presses on the nerves and blood vessels at the back of the socket and causes pain. Usually, the protective disc (cartilage) is displaced forward and no longer serves as a cushion between the condyle (lower jaw) and the bony socket (skull) and eventually this can lead to the condyle rubbing against the bony socket. 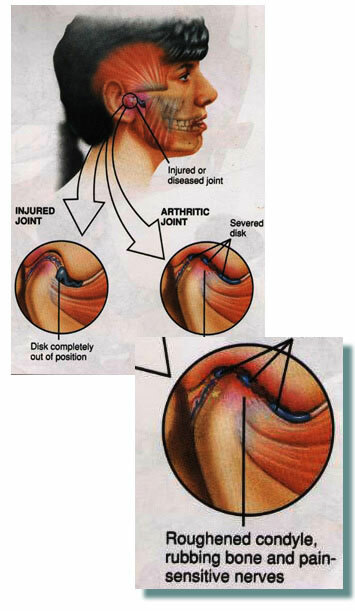 This can cause a problem called osteoarthritis. Mild displacements cause a clicking or popping sounds in the jaw joint. When the disc becomes displaced, this is what causes the various noises within the jaw joints such as clicking and popping sounds. Patients must be aware that any noises or pain that occur during the opening and closing of the jaw is an indication that the jaw joints have become dislocated. Patients are advised to seek treatment as soon as possible to avoid allowing the problem to get worse.